What is MS? An Inside View. What is MS? It’s Life for 400,000 Americans. I talk often about MS and what it’s like to live a daily life with Type 2 – but I’ve had questions from readers that say….what does that mean? I rely on the wealth of information from the National MS Society to tell you about MS: know this. It’s a hard, debilitating disease that attempts to steal your person hood with your life. It can be painful, frustrating, humiliating. Most of all, it’s kinda scary. If you want a first hand account of MS, visit Kelly, a brave young woman who talks frankly about her experience with MS on YouTube. Kelly gives great examples of what it’s like to have your brain malfunction like it’s full of wool, balance issues (I fall over without provocation and stairs are part of my life) and most of all, the tingle of the numbing – mine burns. One cool thing to know about MS? Recently announced, a third stage trial that seems to have remarkable impact on Type 2 Remitting/Relapsing MS…one shot a year, and it arrests the disease in many patients. I’m excited. Most of all, if someone you love is experiencing signs of MS, please talk to a doctor. MS is really hard to diagnose, and it’s different for every person. One thing it has in common for all: it’s hard to live a happy productive life when your own body turns on you. Be a source of encouragement and hope. For all of you with MS – I send you my live, my prayers and the absolute hope that one day, MS will be conquered. MS is one of the few serious diseases that affect each person differently. See you doctor and ask the hard questions if you're concerned. Multiple sclerosis (or MS) is a chronic, often disabling disease that attacks the central nervous system (CNS), which is made up of the brain, spinal cord, and optic nerves. Symptoms may be mild, such as numbness in the limbs, or severe, such as paralysis or loss of vision. The progress, severity, and specific symptoms of MS are unpredictable and vary from one person to another. Today, new treatments and advances in research are giving new hope to people affected by the disease. The body’s own defense system attacks myelin, the fatty substance that surrounds and protects the nerve fibers in the central nervous system. The nerve fibers themselves can also be damaged. The damaged myelin forms scar tissue (sclerosis), which gives the disease its name. When any part of the myelin sheath or nerve fiber is damaged or destroyed, nerve impulses traveling to and from the brain and spinal cord are distorted or interrupted, producing the variety of symptoms that can occur. An important note: most people with MS learn to cope with the disease and continue to lead satisfying, productive lives. People with this type of MS experience clearly defined attacks of worsening neurologic function. These attacks—which are called relapses, flare-ups, or exacerbations —are followed by partial or complete recovery periods (remissions), during which no disease progression occurs. 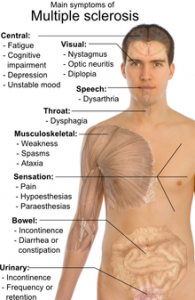 Approximately 85% of people are initially diagnosed with relapsing-remitting MS. This disease course is characterized by slowly worsening neurologic function from the beginning—with no distinct relapses or remissions. The rate of progression may vary over time, with occasional plateaus and temporary minor improvements. Approximately 10% of people are diagnosed with primary-progressive MS. Following an initial period of relapsing-remitting MS, many people develop a secondary-progressive disease course in which the disease worsens more steadily, with or without occasional flare-ups, minor recoveries (remissions), or plateaus. Before the disease-modifying medications became available, approximately 50% of people with relapsing-remitting MS developed this form of the disease within 10 years. Long-term data are not yet available to determine if treatment significantly delays this transition. In this relatively rare course of MS (5%), people experience steadily worsening disease from the beginning, but with clear attacks of worsening neurologic function along the way. They may or may not experience some recovery following these relapses, but the disease continues to progress without remissions. Since no two people have exactly the same experience of MS, the disease course may look very different from one person to another. And, it may not always be clear to the physician—at least right away—which course a person is experiencing. “Depression” is a term that people apply to a wide variety of emotional states. These may range from feeling down for a few hours on a given day to severe clinical depression that may last for several months. People with MS and all those closely associated with them should be aware that depression in its various forms is common during the course of multiple sclerosis. In fact, studies have suggested that clinical depression, the severest form of depression, is more frequent among people with MS than it is in the general population or even in persons with other chronic, disabling conditions. Depression does not indicate weak character and it should not be considered something shameful that needs to be hidden. Depression is not something that a person can control or prevent by willpower or determination. In its most severe forms, depression appears to be a chemical imbalance that may occur at any time, even when life is going well. The most effective treatment for depression is a combination of psychotherapy and antidepressant medication. Although support groups may be helpful for less severe depressive symptoms and generalized distress, they are no substitute for intensive clinical treatment. Persons with MS often experience losses—for example of the ability to work, to walk, or to engage in certain leisure activities. The process of mourning for these losses may resemble depression. However, grief is generally time-limited and resolves on its own. Moreover, a person experiencing grief may at times be able to enjoy some of life’s activities. Clinical depression is more persistent and unremitting, with continuous symptoms lasting at least two weeks. Grieving is generally related to changes in self-image triggered by the disease—e.g., no longer being able to think of oneself as an athlete. However, this process seems to be evolutionary and, with time and adaptive coping strategies, the individual can develop an altered self-image. Grief generally resolves with time even without treatment. However, supportive counseling, support groups, as well as an understanding and supportive environment can help the process along. Life is full of stress and MS generally adds a hefty dose of disease-related stress to the mix. MS is unpredictable and just anticipating the next exacerbation can be a significant source of stress. MS can also lead to some major life changes such as loss of mobility and interference with work. Thus the person with MS faces significant challenges in coping with a potentially stressful life. Stress has also been cited as a possible precipitant of the onset of MS or a trigger for exacerbation. Studies of the effects of stress on MS, however, have had conflicting results. It is important to not fall into the trap of trying to “avoid stress,” a nearly impossible task given the realities of life. Moreover, family and friends should not make the mistake of feeling guilty because they think they may have “created stress” in the person’s life. Stress is part of the reality of living and probably the best approach, rather than trying to avoid it, is to learn how best to manage and cope with it. Stress-management programs are readily available and have become an accepted part of the treatment of many medical disorders. Professional counseling as well as support groups can also help in learning how better to cope with stress. ← Why Do I Love You?